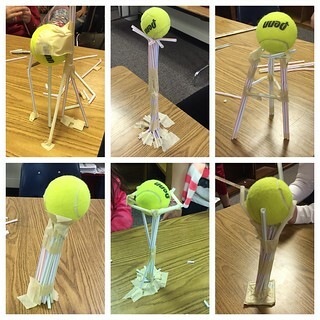 These are engineering design challenges we're using as STEM class lessons in Spring 2015. Links to additional resources for more are included too! 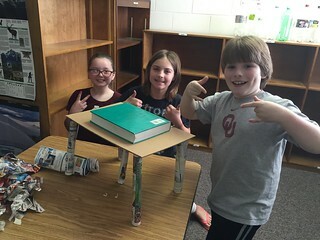 Summary: With your team in 20 minutes, construct a table using provided materials that will support a heavy dictionary at least 8 inches off the table for at least 60 seconds. Check out our Flickr photo set of student paper tables! Summary: With your team in 20 minutes, build a straw structure that can support a tennis ball above the table for 15 seconds or more. Measure the height. Check out our Flickr photo set of student straw towers! 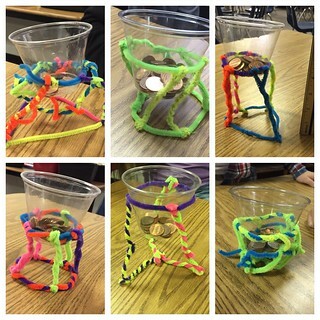 Check out our Flickr photo set of student pipe cleaner structures! Summary: With your team in 20 minutes, build the tallest tower you can with Legos that will support a tennis ball above a table. Measure the height in inches from the tabletop to the top of the tennis ball. 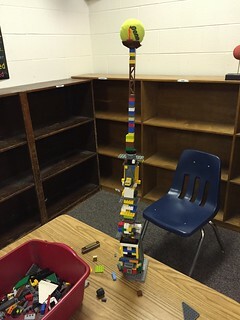 Check out our Flickr photo set of student Lego towers! Engineering Challenges by "Growing a STEM Classroom"
Image attribution: Thanks to ImageArchive for the Flickr icon used on this page.